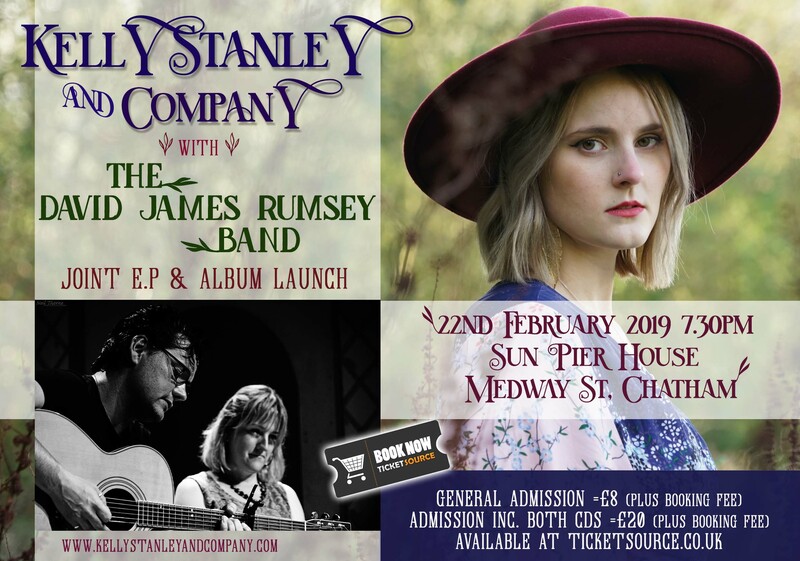 Medway based Alt Folk trio Kelly Stanley & Company release their long awaited E.P 'A Way To Be' on the 22nd February and invite you all to join them as they celebrate with a night of live music at the lovely Sun Pier House Chatham. Joining them are long time friends The David James Rumsey Band whose stunning new album will also be available on the evening! We are also pleased to announce local artist Luna Zsigo will be responding to the music live by creating works of art! – Casey Heyburn BBC Radio Kent. Described as ‘Spellbinding’, Kelly Stanley is not your average Singer/Songwriter. Armed with a passionate and skilled voice, Kelly captures the listener as she questions what it is to be human in this world. Performing Kent and beyond since the young age of 12, Kelly has vast experience in many types of venues and has appeared in the press and national television multiple times. As Kelly Stanley & Company, she is joined by Joe Millgate on Double Bass and Liz Ost on Cello; blending together to create a powerful emotive drive. It is this fusion of artistry and passion for music which makes Kelly Stanley & Company such a special act, that you truly must see live. Inspired by the true greats of folk, David's style is as elegant as it is rich in emotion and heart. All good players with a feel for the music are welcomed by David so the lineup varies gig to gig. Regular players in the band include Emma Peto on Harmonium, percussion and backing vocals, Tim Odell on Bass Guitar & Paul Brassington on Violin. David's music and the passion that he and his talented band of musicians play with will immerse you in a rich soundscape that you won't want to break free of.